Researchers have identified a previously unknown feature of human anatomy with implications for the function of all organs, most tissues, and the mechanisms of most major diseases. Published online on March 27, 2018 in Scientific Reports, a new study co-led by an New York University (NYU) School of Medicine pathologist reveals that layers of the body long thought to be dense, connective tissues—below the skin’s surface, lining the digestive tract, lungs, and urinary systems, and surrounding arteries, veins, and the fascia between muscles—are instead interconnected, fluid-filled compartments. This series of spaces, supported by a meshwork of strong (collagen) and flexible (elastin) connective tissue proteins, may act like shock absorbers that keep tissues from tearing as organs, muscles, and vessels squeeze, pump, and pulse as part of daily function. Tbe open-access article is titled “Structure and Distribution of an Unrecognized Interstitium in Human Tissues.” Importantly, the finding that this layer is a highway of moving fluid may explain why cancer that invades it becomes much more likely to spread. Draining into the lymphatic system, the newfound network is the source of lymph, the fluid vital to the functioning of immune cells that generate inflammation. Furthermore, the cells that reside in the space, and collagen bundles they line, change with age, and may contribute to the wrinkling of skin, the stiffening of limbs, and the progression of fibrotic, sclerotic, and inflammatory diseases.The field has long known that more than half the fluid in the body resides within cells, and about a seventh inside the heart, blood vessels, lymph nodes, and lymph vessels. 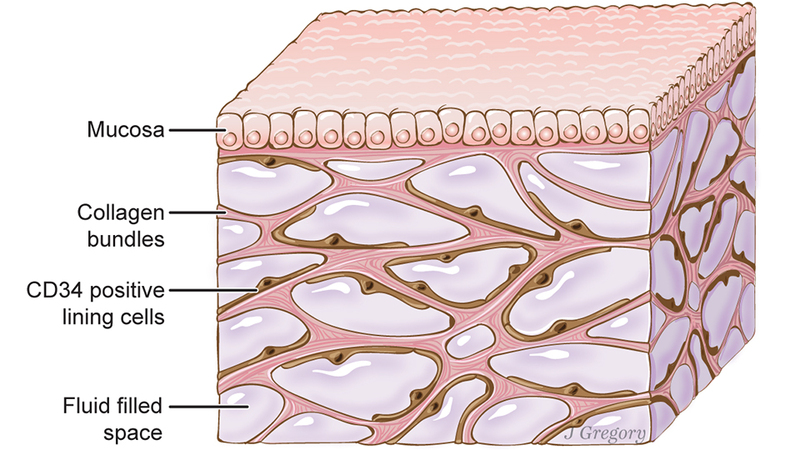 The remaining fluid is “interstitial,” and the current study is the first to define the interstitium as an organ in its own right, and as one of the largest of the body, say the authors. Modern neuroscience, for all its complexity, can trace its roots directly to a series of pen-and-paper sketches rendered by Nobel laureate Santiago Ramón y Cajal in the late 19th and early 20th centuries. His observations and drawings exposed the previously hidden composition of the brain, revealing neuronal cell bodies and delicate projections that connect individual neurons together into intricate networks. As he explored the nervous systems of various organisms under his microscope, a natural question arose: What makes a human brain different from the brain of any other species? At least part of the answer, Ramón y Cajal hypothesized, lay in a specific class of neuron--one found in a dazzling variety of shapes and patterns of connectivity, and present in higher proportions in the human brain than in the brains of other species. He dubbed them the "butterflies of the soul." Known as interneurons, these cells play critical roles in transmitting information between sensory and motor neurons, and, when defective, have been linked to diseases such as schizophrenia, autism, and intellectual disability. Despite more than a century of study, however, it remains unclear why interneurons are so diverse and what specific functions the different subtypes carry out. Now, in a study published in the March 22, 2018 issue of Nature, researchers from Harvard Medical School (HMS), the New York Genome Center, New York University, and the Broad Institute of MIT and Harvard have detailed for the first time how interneurons emerge and diversify in the brain.